Bath Bach Choir is a group of about 90 musical people who share a passion for singing beautiful and demanding choral works and songs, from any era, to a high standard. We love a challenge, we’re committed, and we aim to give really great performances, with sensitivity, humour and zest. The Musical Director is Nigel Perrin, who is renowned for his musicianship, energy and inspirational leadership. In 2015 he celebrated 25 years of directing the choir. Thanks to his vision we can perform a wide repertoire to a very high standard. Our repertoire begins before Bach and ends in the present. In March 2011 we performed James Macmillan’s St John Passion in the presence of the composer – so ambitious it had never previously been performed outside the main concert centres; summer 2009 saw us performing Will Todd’s Mass in Blue, a jazz work, for which Will Todd played the piano. In 2008 Elis Pehkonen came to hear us sing his Russian Requiem in Bath Abbey; and we have given some of the earliest performances of works by Dr Karl Jenkins. We commissioned Ed Hughes to compose a work to commemorate our 60th anniversary, and gave the first performance of his Song for St Cecilia at Wiltshire Music Centre in 2007. We are equally at home with Vivaldi (the Gloria from memory in 2008), Duruflé and Handel, whose Messiah – baroque performance, parts of it from memory – featured at Easter 2014; and we sang Tchaikovsky's Vespers in Malmesbury Abbey, in Old Church Slavonic, summer 2015. The choir also tours: it has sung at Notre Dame in Paris, at Chartres Cathedral, and in Hungary, Belgium and Germany. In January 2008 a group sang Karl Jenkins’s Requiem at Carnegie Hall in New York, and in October 2009 we sang at the Thomaskirche in Leipzig, J S Bach’s church. In October 2011 we gave a concert in Sant’ Agnese in Agone in Rome and took part in Mass at the Venerable English College. 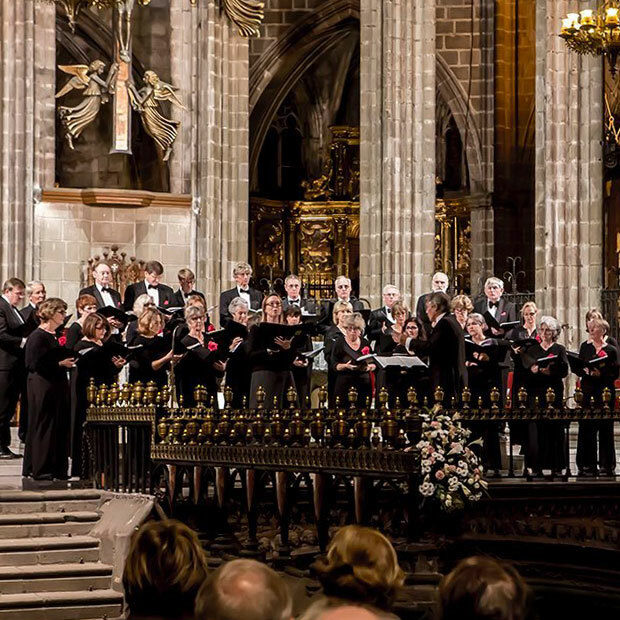 In 2013 we cemented ties with our twin city in France, Aix-en-Provence, performing in the Cathedral of St-Sauveur; and in October 2015 we sang two masses and two concerts in Barcelona. Our rehearsals are focused but fun. We organise open evenings and run an annual workshop, led by Nigel; we travel together; and we have been known to end a few evenings in the pub.